This initiative is an operational project of the Convention on the Protection and Promotion of the Diversity of Cultural Expressions, which reaffirms the importance of promoting innovative partnerships responding to the needs of developing countries. The Global Alliance operates at two levels: it provides information and tools on the partnerships through a web platform and supports operational projects in the field. The Global Alliance was created in 2002 to explore the potential of partnerships in creating, consolidating and advancing the development of cultural industries in developing countries. People: Building the capacities of cultural professionals and individual entrepreneurs through training, mentorship schemes, direct exchange of knowledge and experience. Example: training and mentoring programme to build managerial capacities of the administrators of Nzassa, a cultural industries incubator in Côte d’Ivoire. Institutions: Reinforcing capacities of public institutions and infrastructures, cultural networks and professional associations and/or cultural enterprises operating at different stages of the value chain. Example: a multinational company provided a Cuban music distribution network of retail outlets with marketing and sales training to help them increase the sell of locally produced music. Environments: Designing enabling regulatory and policy environments that encourage the partnering process and address obstacles. Example: bringing together public, private and civil society partners to create a National Plan of Action for the Music Industry in Jamaica. 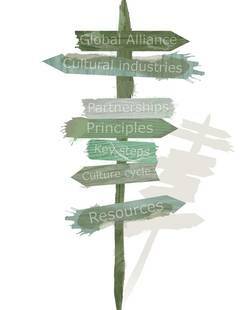 In 2008, an evaluation of the Global Alliance showed the need to provide its stakeholders with practical information to foster the establishment of new partnerships in cultural industries as part of a continuous process of adapting to the current global environment and the changing needs of its stakeholders. The unanimous adoption of the UNESCO Declaration on Cultural Diversity in 2001 signalled universal agreement that the governance of culture and the promotion of cultural diversity requires building partnerships between the public, private and civil society sectors. The 2001 Declaration served as the premise for the creation of the Global Alliance for Cultural Diversity. Market forces alone cannot guarantee the preservation and promotion of cultural diversity which is the key to human sustainable development. From this perspective, the pre-eminence of public policy, in partnership with the private sector and civil society, must be reaffirmed - 2001 UNESCO Declaration on Cultural Diversity. The adoption and entry into force of the Convention on the Protection and Promotion of the Diversity of Cultural Expressions endorsed the activities of the Global Alliance and further encouraged the development of partnerships in cultural industries. More specifically, the Convention's Article 14 (Cooperation for development) and Article 15 (Collaborative arrangements) clearly illustrate the importance of partnerships and multi-sectoral cooperation in the development of the culture sector. The operational guidelines of these Articles put forward values underpinning the partnering process including equity, transparency, mutual benefit, responsibility and complementarity. Parties shall encourage the development of partnerships, between and within the public and private sectors and non-profit organizations, in order to cooperate with developing countries in the enhancement of their capacities in the protection and promotion of the diversity of cultural expressions. These innovative partnerships shall, according to the practical needs of developing countries, emphasize the further development of infrastructure, human resources, policies, as well as the exchange of cultural activities, goods and services. By exploring the potential of partnerships in cultural industries for development and supporting the creation of new collaborative arrangements, the Global Alliance ultimately aims to foster the contribution of local cultural industries to economic growth and sustainable development. In addition to empowering the role of culture in society, this strategy helps promote a multi-stakeholder participatory approach to better identify and coordinate their needs and strengths in order to develop their own development strategies. Moreover, the partnerships have proved to foster local ownership and sustainability of the projects implemented as they bring together actors from different sectors to collaborate towards the achievement of well defined common goals. Each partner has a specific role and responsibility to fulfil and therefore their success is co-dependent on effective and productive collaboration complementing each other's capabilities and resources. To better respond to the requirements of partnership initiatives, the Global Alliance resource centre provides a series of tools, put together using the experience gained on projects undertaken since 2002, in order to facilitate partnership management at each stage. These tools have been systematized to make it easier to adapt them to different contexts and encourage ownership by all. They form a base from which everyone can work together. Each user can contextualize and adjust them to his/her requirements and constraints. We also invite all stakeholders to contribute to the resource centre with content, examples and suggestions.